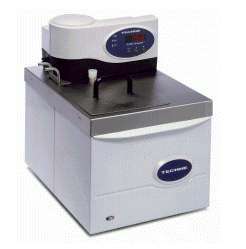 Compact, accurate and reliable liquid baths for calibration. The LCB-12 bath has a thermometer hole to take a reference thermometer, drain tap, lid, carrying handles and insulation on sides and base. A built in cooling coil is included. The 12 inch immersion depth of the LCB-12 makes it an excellent choice for use in the calibration of liquid in glass thermometers, RTD's, thermocouples and fluid filled bulbs. Controllers incorporate the safety features of an over-temperature cut-out and low liquid level device. The system offers a display accuracy of Â±1.0Â°C, but if you require higher accuracy take a look at one of the thermometer systems we offer. We recommend the use of our bath liquids to get the best performance at a wider range of operating temperatures.